We offer variety of International Courses for students in bachelors and Masters program. 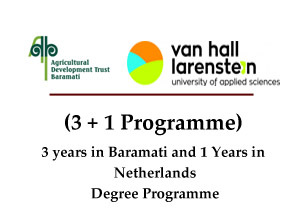 It is a collaborative 4+1 programme between College of Agriculture, Baramati and Asian Institute of Technology Bangkok and MPKV, Rahuri. It offers Masters in Agri Business Management. The intention to start an International Centre at College of Agriculture, Baramati, aiming to build bridges between Indian and Dutch Research, Education and private sectors. One of the elements of cooperation is indented to be An educational exchange programme at undergraduate level so called 3+1 concept.